A poll released on Tuesday by the Emerson College Polling Society shows that conservative Republican Roy Moore leads liberal Democrat Doug Jones by six points in the December 12 special election for the U.S. Senate in Alabama, 53 percent to 47 percent, in a one-on-one matchup. The poll of 500 “very likely voters” was conducted between November 25 and 27 and has a margin of error of 4.3 percent. The previous Emerson Poll, conducted between November 9 and 11 as the stories of alleged sexual misconduct by Moore broke, showed Moore with a ten-point lead, 55 percent to 45 percent. The new Emerson College Poll is consistent with a Change Research poll released on Monday that shows Moore with a five-point lead, 49 percent to 44 percent. As Breitbart News reported, a Republican establishment-backed candidate, Lee Busby, has now emerged as a write-in candidate. 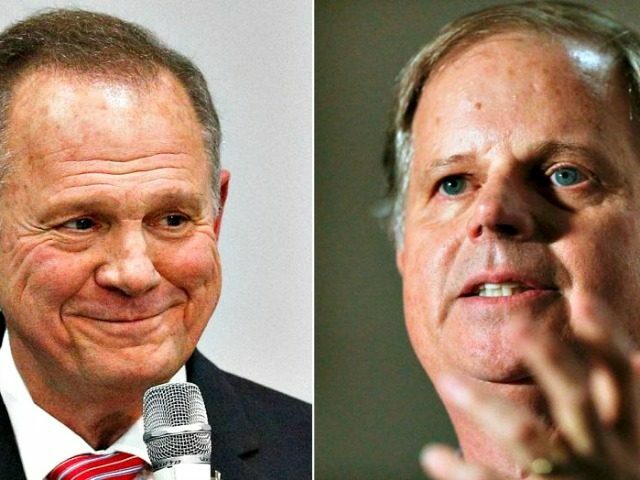 A poll released by JMC Analytics on Wednesday, which includes a write-in option, shows that Moore has a five-point lead over Jones, 48 percent to 43 percent, with a write-in candidate receiving 4 percent of the vote. The JMC Analytics Poll of 650 likely voters was conducted between November 27 and 28 and has a 3.8 percent margin of error. The Real Clear Politics Average of Polls currently shows Moore with a one-point lead. why not support Putin. He also is against Gay Marriage and restoring the Orthodox Russian Church.